Winner of several toy awards. It's educational fun for ages 6 and up! Your own insect civilization at home! Experience this fascinating, timeless classic for the 1st time or live it all over again, and get a peek into the amazing underground world of the ant. Watch them build bridges, dig tunnels, and move mountains! 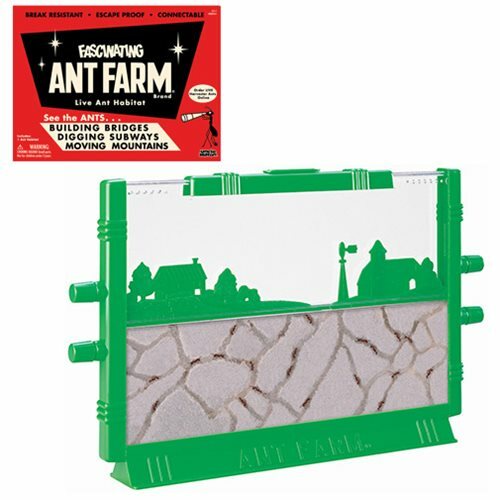 This Limited Edition Gold Ant Farm-- in original die-cut display box with authentic 1956 graphic treatment-- is sure to wow fans, young and old. The ant farm measures 6-inches tall x 9-inches wide x 1-inch deep. The packaging is so gorgeous, you might not even take the farm out of the box! The winner of several toy awards, this exciting habitat spells educational fun for ages 6 and up! Note: This item includes an order form to order live ants by mail. Postage and handling fee required. Ants shipped only within continental limits of the USA.